Microchips are about the size of a corn of rice. 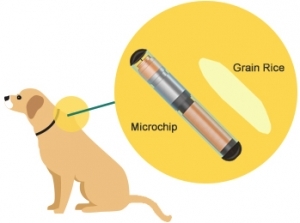 Microchipping involves the placement of a microchip under the skin between the shoulder blades. It is a quick and simple procedure that can be performed awake or during a sedated procedure such as a spay or neuter. The chip is then registered to the owner and a tag is provided to put on your pets collar. This information should be updated if your address or phone number changes. If a pet becomes lost they can be easily scanned by animal control or a veterinarian. This greatly increases the chances of a pet being united with its owner. The reality is that 1 in 3 pets goes missing in their lifetime.